Cast-in-stone is a New Service from DansMark Software Solutions! Anything you want for your CastStone design is what we do! From design, purchasing, product & production drawings, to mold drawings, shipping and receiving. DMSS can help automate it ALL for you! Cast-In-Stone Software is a complex assortment of Autolisp routines, VBA, C+, & Diesel-Script, that creates 2D & 3D drawings, for the Cast-Stone industry. You can use YOUR profile-shapes & parts, to custom design your products using DMSS's CastStone software! Even give them to your Architect(s) to design their buildings using YOUR products! A complete Bill-of-materials of all parts, even your custom designs are a couple of clicks away! What's even more important is whatever programming you need, DMSS can create for you. Need complex balustrade systems with piers & columns and arch'd headers in seconds? Just point, click an it's done! Fast & easy! The DansMark way! How about complex banding with corbels spaced every 36" & keystones every 5th corbel around the whole perimeter of the house? B.O.M. 's as fast as you can think! Level 1) You buy the programming, and do all the work yourself. Level 2) Send your drawings to DansMark Software Solutions, and DMSS will design your products for you, using YOUR profile-shapes & parts. Level 3) Out-sourcing to DMSS! DMSS can draw all your CastStone designs for you! Just send your AutoCAD drawings (.dwg) of the desired products on the building(s), the shapes you want to use and where they apply, and DMSS will use your shapes to draw your product onto the building(s). DMSS can even do all your take-off's for you, design all your drawings, and give you back a completed job, without you having to do anything more than send your jobs to DMSS! Either way, it a great way to save time and money on custom Cast-Stone design! This is DMSS's premiere software! This software can create a complete catalog of all your parts and a premium software program to use all your newly created catalog parts with! (4 views of each part, in a title-block, to scale). What programming do you need? Creates a whole Catalog with your drawings, complete with 4 views. 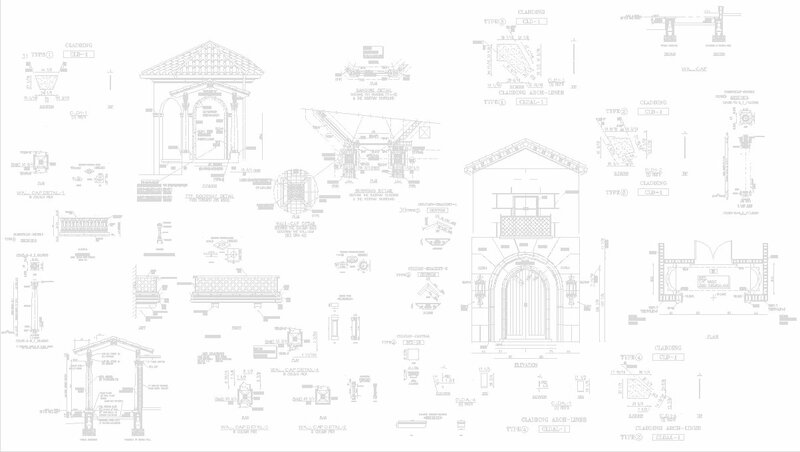 Elevation, plan, & catalog/shop drawings.